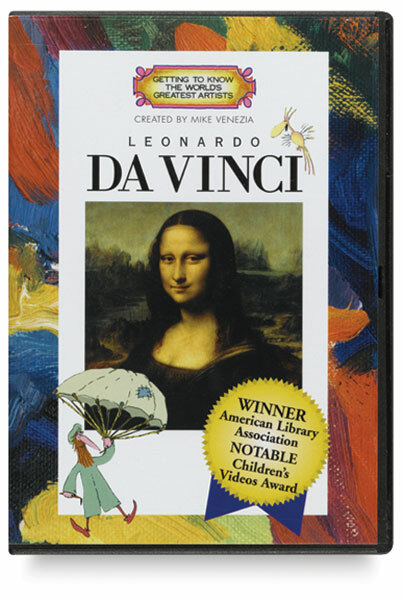 Each of these DVDs presents a lighthearted, intelligent, and appealing introduction to one of the world’s greatest artists in the style of Mike Venezia’s award-winning children’s books. Praised by Booklist, School Library Journal, and Video Librarian, these DVDs are loved by teachers, librarians, parents, and kids alike. Degas — When is an Impressionist not an Impressionist? When he's Edgar Degas! Degas showed his work with Cassatt, Monet, and Renoir, but he never considered his art to be "Impressionist" art. Why not? Young viewers will learn the reasons from an animated Degas himself, as they watch him tell the story of his life and his artistic career. 22 minutes. Ringgold — Can you fly? Faith Ringgold believes you can. 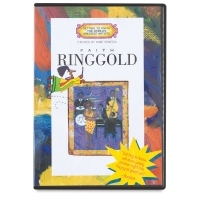 An animated Ringgold guides viewers through a kid-friendly look at her life, times, and work — from her childhood in Harlem, through the cultural upheavals of the 1970s, to her position today as a respected contemporary artist and author. Historic photographs and music complement this fun, fact-filled look at Ringgold's paintings, mosaics, and renowned story quilts. 22 minutes. Monet — Claude Monet and his French Impressionist "pals" are brought to life in this entertaining, animated video. Now kids can have fun learning about Monet’s life and paintings through a playful combination of great art and delightful off-the-wall cartoons. This DVD is an American Library Association 2002 Notable Children’s Video Award winner. 22 minutes. Rembrandt — How did one 17th-century Dutchman’s work become the world standard for art? Let Rembrandt van Rijn tell you the story of his own life and creative career in this lighthearted and informative look at one of the world’s most famous artists. 23 minutes. Michelangelo — Michelangelo tells you his own life story in an entertaining way that mixes art history with playful cartoon humor. From his childhood and student days in Florence to his career in Rome as a sculptor, painter, and architect, Michelangelo’s tale is a factual and fun-filled introduction to one of the most famous names of the Italian Renaissance. 23 minutes. Warhol — Pop Art icon Andy Warhol narrates the story of his life and artworks in this child-friendly, animated introduction to “one of the best known and fun periods of art ever!” Covering Warhol’s blue-collar birth in Pittsburgh to his (much more than) fifteen minutes of worldwide fame, Warhol also puts his art in context with modern art contemporaries including Rauschenberg, Johns, Oldenburg, and Lichtenstein. This DVD is an American Library Association 2007 Notable Children’s Video Award winner. 24 minutes. Cassatt — Say "mother and child," and what artist comes to mind? Get to know Impressionist artist Mary Cassatt, famous for her tender portraits of families and children. Why didn’t Mary’s father want her to be an artist? What turned Mary and her friend Edgar Degas into mad scientists? What made her huge World’s Fair mural so mysterious? Find out as you laugh and learn with one of the world’s best-loved artists. 24 minutes.